Gotu Kola plant, Centella asiatica, has the synonym Hydrocotle asiatica and is also known as Indian Pennywort and Arthritus Plant. Gotu Kola is a traditional Asian food and herb, which is regarded as food for both the brain and body. Increases mental clarity and longevity. In southern Asia the leaves are used as flavouring in curry and raw in salads. A useful medicinal and culinary herb. 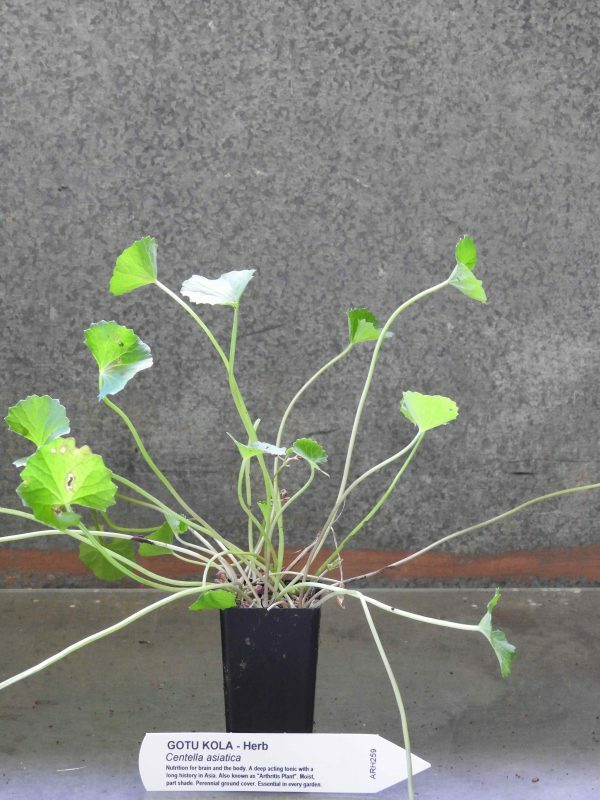 Gotu Kola plant is a native of Asia and India and prefers moist, well composted soils in a protected, partially shaded position. Drought and frost tender – will tolerate a light frost. A perennial ground cover, growing to 0.1m x 0.5m. Be the first to review “Gotu Kola, plant” Click here to cancel reply.